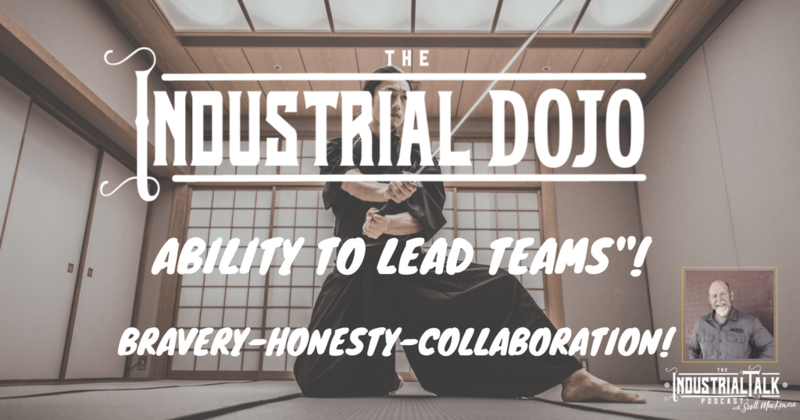 Industrial Leaders must possess the Ability to Lead Teams! Through BRAVERY, HONESTY AND COLLABORATION, Winston Churchill led a country through a very dark period in history – He Led a Team to Victory! As a Leader you must lead your team to Victory through Bravery, Honesty and Collaboration! 00:00 You are listening to the industrial talk podcast network. [00:18] We'll talk podcast. So glad that you are here. You industrial leader, you. Thank you very much for joining this. The Industrial Dojo. We are building an industrial leader and I know time is everything. Time, time, time, time. So let's get this show on the road. And then once again, thank you for joining the industrial talk podcast. We're going to make this fast and quick leader, leader, leader, right? Gorgeous Day out there. orld war two, he lead a team. All right, he lead a country. So I'd like to be able to start this with a quick little quote and bear with me and, and uh, it is motivational here. Winston Churchill, we have before us an ordeal of the most grievous kind we have before us. Many long months of struggle and of suffering. You ask, what is our policy? I will say it is to wage war by sea, land and air with all our might. And with all the strength that God can give us to wage war against a monstrous tyranny, never surpassed in the dark and the lamentable catalog of human crime. That is our policy. You ask, what is our aim? I can answer in one word, victory at all costs. Victory in spite of all terror, victory, however long and hard the road road may be for without victory. There is no survival Wu. Can you imagine that? I mean, even I get tickled by that and I want wanna. I want to just hit the day running real fast. And then can you imagine what a team would be like? The bravery that, that, uh, Winston Churchill demonstrated. We have to have that bravery, that honesty, that clarity, that, that pinpoint focus, that honesty. So nobody knows. Everyone is like, yeah, I get it, man. There's no ambiguity. It's victory. And that collaboration, you know as well as I do, there was no way that there would be victory without collaboration in a same thing. When you look at teams, you have to be brave. You have to be honest, and you have to be in a collaborative environment. So think about that. I challenge you with that because that's I, I, for me, that's a great analogy. So let's review where we're at. We'll make it quick because I know your time is very important. [04:17] Yesterday we talked about shouldering the burden. Be The hero, OK, be the hero because you know it's. I think of Mother Teresa. I love drawing upon these individuals the ability to be strong and clear in times of trouble when sinned. Churchill, let's talk about steadfast dedication to those. Depending on you, it is not about you, it's about them, right to always been about them and about your family, a bit about your employees and so on and so forth. Courage to ask assistance and guidance. I don't have the answers. You don't have all the answers, but in a collaborative environment, you can find the answers. Self disciplined to patients. One more day, get up one more day. You can do this. Mental strength, confidence in your own ability. You're here studying. You're here listening. I guarantee you're out there looking for other answers to which is very, very important. [05:07] You're constantly learning resistance to criticism. People are going to want to pull you down, Yank it back, because that's what they do. You're tenacious, right? So genuine interest in the well-being of people. Got To have that. That's just, you know, you're going to reverse your servant. You are a servant. You got a rock solid purpose. Once again, nh. You've got a positive outlook. I hang out with positive people. You hang out with positive people. It's a lot of fun. Life is wonderful because you're hanging out and then when challenges happen, you still have a positive outlook and you got correct thinking shadows of the past. Do not dictate of who you are today, right? You can keep going. Who cares about the failures? Who cares about all the challenges you have? We all have. We're not immune that so correct thinking. Thank you very much. Really appreciate you joining. And um, do you have a great day as you'll hear from me again tomorrow because this is a lot of fun to have a great day. Be Safe. Always be safe. Yeah.